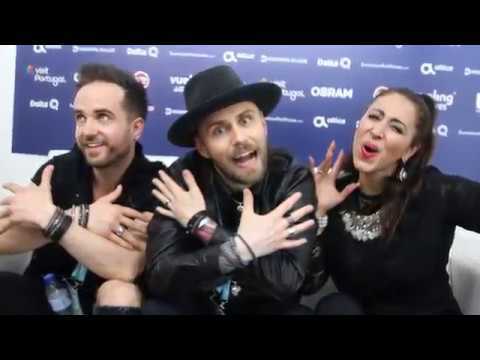 This year Poland also had a great national final called “Krajowe Eliminacje” to determine representative for Lisbon at the ESC. Out of ten finalists the Swedish-Polish combo made the race with the very uplifting song “Light Me Up”. With this international approach the chances for Poland really seem to be as high as never before. The duo consists of the Polish songwriter, producer and DJ Andrzej Gromala better known as Gromee and the Stockholm based singer and songwriter Lukas Meijer. Andrzej was born in 1978 and is very popular in the house and electro scene. He had several hits in Poland, his songs and videos have been streamed millions of times. Andrzej received double platinum, platinum and gold records worked with David Guetta, Enrique Iglesias and Mariah Carey. Lukas born in Stockholm in 1988, grew up in Ulricehamn close to Borås. He is mainly known as head of the band “No Sleep For Lucy”. Both Lukas and Andrzej work together since 2017. “Light Me Up” is a very optimistic song with the “feel good” element. Judged by the video clip this could be a really good summer hit. People are dancing in the sunshine and enjoy life. This is also reflected in the lyrics, where it’s said “feeling free to breathe” or “this spark feel inside”. The chorus is memorable and catchy and has modern elements. This entry is very radio friendly. Let’s hope they will bring a lot of sunshine to Lisbon. This entry could really have very good chances this year. Poland had its debut in the 1994 Eurovision Song Contest in Dublin, Ireland. So this year it’s already the 21st time for Poland in the ESC. Together with six other debutants, the year of 1994 was the year of new countries all from Eastern Europe. It’s a truly success that the Polish entry “To Nie Ja!” by Edyta Górniak made a wonderful second place from the stand. This has opened a world career for Edyta and she is still a star in Poland. And it proofs that a good song with a good singer could change everything. This brought a lot of positive attention to Poland. Unfortunately, this strong performance could not be maintained over all those years until today. Poland’s contributions in the first years were quite extraordinary and special in particular as they have tried to find their position with offbeat compositions. The effort of the Polish composers and performers to develop Poland as a new highlight in the ESC has paid off. But some of the songs might have been too complicated for the average European taste. That’s why the Polish entries struggled and still do struggle with the qualification for the Grand Finals recently. Since 2004 Poland only made it six times into the Grand Final. And over all Poland made it in the Top 10 three times. This is statically chance of 14% for Poland. In Stockholm 2016 Michał Szpak could achieve a fabulous 8th place with “The Colour Of Your Life”, he was one of the last countries to be announced the fourth highest points from the televoting. Last year Kasia Mós could reach the Grand Final, but only came 22nd.